Known for innovative design and quality construction the Nicols yard is one of the most prolific constructers of inland waterway craft in France both for the hire and private markets. Heavily constructed to cope with hire fleet life, the Estivale range retains the convivial “all an one level” day spaces and aft deck terrace of the Sedan range, the quality equipment and finishings of the Confort range and adds port and starboard side doors to facilitate access in all circumstances. This Estivale Octo left the yard in 2009 and shows a high standard of maintenance. Just two double cabins in nearly 11 meters of boat, each with ensuite WC and shower. Both double beds are 1.90m x 1.40m but can be easily pushed apart to form two singles. Dinette also convertible in one double.The sedan layout affords great day spaces with light bright saloon and panoramic windows and full width “patio” doors for great visibility. The Nicols Estivale Octo is an easy boat to move around with just three steps separating the day spaces from the cabins and the swim platform, the terrace and the saloon are all on one level. A practical kitchen (galley for the “salty dogs” amongst you!) with double sink, 220 litre fridge and four burner cooker with oven and 1150 litres of water on tap for extended autonomy. The interior is heated by Truma 4000 warm air central heating and hot water is from a 100 litre tank heated by the engine with connecters for the unique Nicols swimming pool available by separate negotiation. On deck forward is a dining table ideal for intimate dining or those solitary moments with a good book, whilst the aft terrace, all on one level with the saloon is great for entertaining. Then there’s the fly bridge with steering position and lots of room for sunbathing. 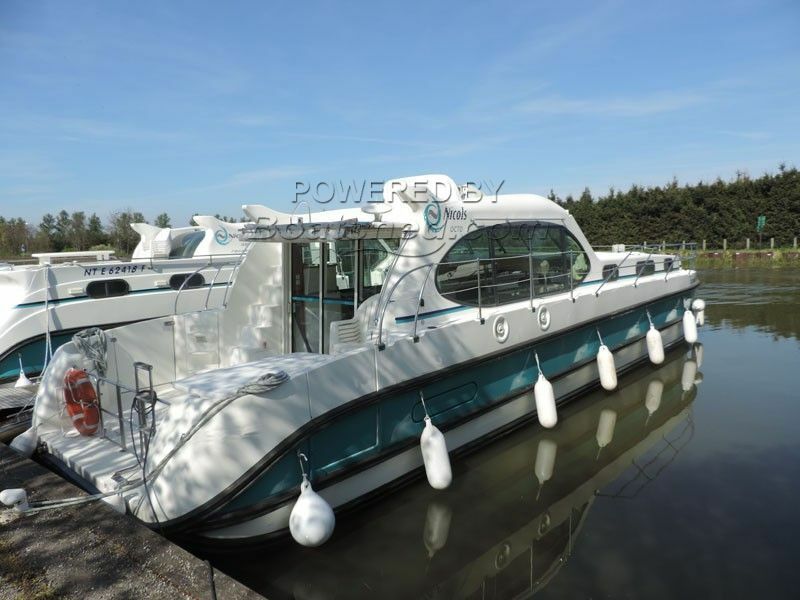 Canal and river cruiser for sale by Boatshed Bourgogne. We are pleased to offer this Nicols Estivale Octo for sale. Nicols are renowned for combining innovative design and quality construction and their distinctive motor cruisers are a familiar site throughout Europe’s waterways. With quality trim and equipment the Estivale range make ideal boats for refined personal use. Ease of movement, ease of maintenance this Octo has been prepared for sale by Nicols themselves and is well worth a visit. For further information and appointments to view, please contact Graham WHARMBY your broker at Boatshed Bourgogne. This Nicols Estivale Octo Canal And River Cruiser has been personally photographed and viewed by Boatshed broker of Boatshed Bourgogne. Click here for contact details.